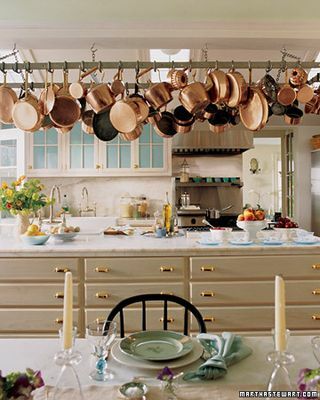 Just notice that all of the pans and pots look worn. 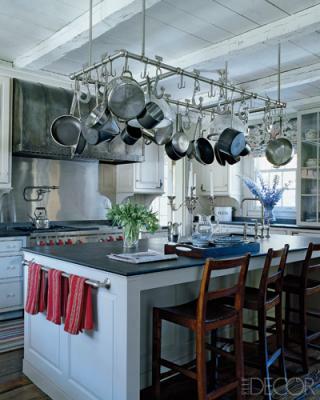 Using a pot rack just for decoration does not make so much sense, as your pots will just hang around there collecting dust. 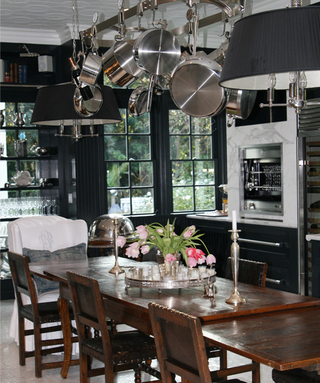 Pot racks should be both decorative and functional. 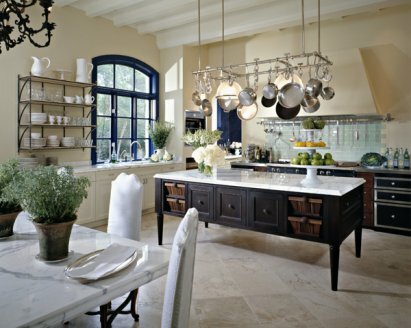 This kitchen has a large pot rack hanging over one of the most beautiful kitchen islands I’ve ever seen. Did you know that accessing your pots from a pot rack is much more ergonomically correct? It’s much better for your back to reach upward than having to bend down to reach them from lower cabinets. 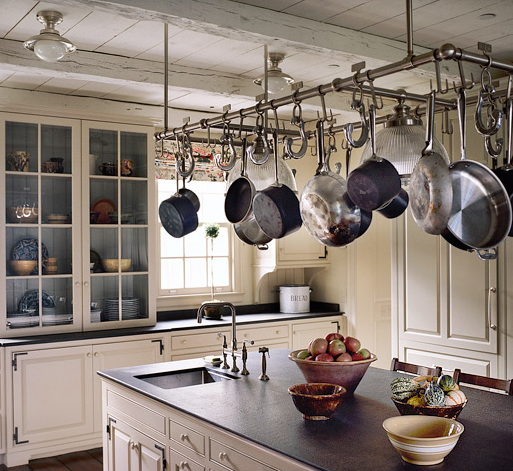 If you have a large collection of pots, place the most used ones on your pot rack. To be frank, pot racks are most ‘at home’ in more rustic settings. 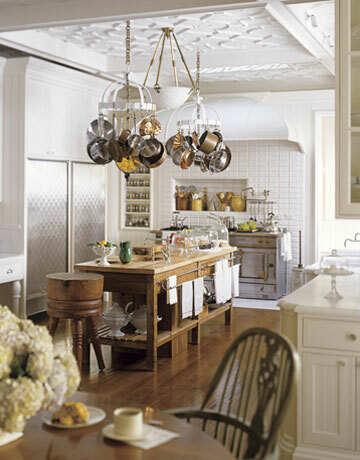 However, one of the major issues with those kitchens is the usual lack of upper cabinets and so storage: a very practical benefit of pot racks is their space-saving abilities, however – one more reason they are perfect there. 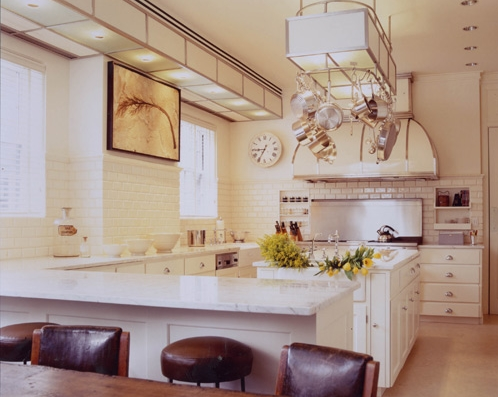 In this kitchen, the pot rack is integrated into a modern light fixture, suspended above a traditional island. One thing about pot racks to consider is height. You’ll want to make sure your pot rack is hung at a level where you can easily access your pots comfortably without having to strain. 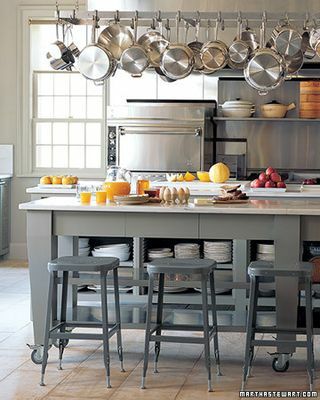 The pot rack here complements the modern feel of the kitchen. 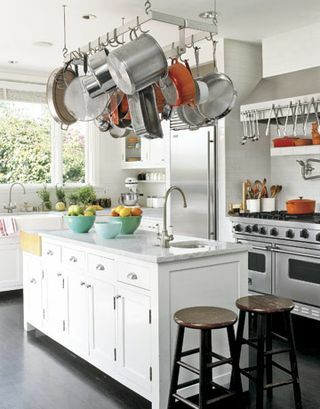 Take a look at how a few pieces of bright orange enameled cast iron cookware are included among the stainless steel pots which provides an unexpected yet welcome punch of color. Hey, thanks, and thanks for visiting! Thanks, I’m always looking for new ideas – pot racks actually are an older one but looks like they get more popular again. Ahh I see. Thanks for that! Did you design these all? I’m very interested in the pot rack in the first picture above. We have a 12ft island in our kitchen and all pot racks I’ve found so far are too small. Is this a custom or commercial pot rack. I’m interested in the pot rack in the first (and third) picture starting from the top of the page. The model with the 2 white lamps. I’ve found it somewhere else in the internet (also different sizes) but I wasn’t able to find the Company which manufacture or sell that model. Can somebody help me? I’m still searching for the industrial pot rack in the 1st & 3rd picture. I have seen several pictures of the exact same pot rack in different kitchens, but have been unable to track down the maker. Do you have any suggestions as to where I could find any information? I have several people searching with no luck! I have visited the howard kaplan design website, but it doesn’t offer this design.